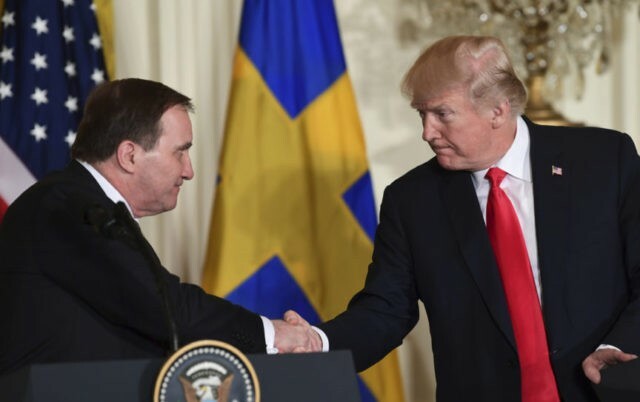 WASHINGTON (AP) — President Donald Trump praised Sweden as a close ally Tuesday, but he also said he had been right in his criticism of the country’s immigration policies. The president drew widespread criticism more than a year ago when he told a rally that immigration was spreading violence and extremism, pointing to “what’s happening last night in Sweden.” Nothing extraordinary had taken place in Sweden the previous night, but it happened to be when Trump saw an analyst talking about the subject on Fox News. Trump has previously claimed vindication, telling Time magazine that soon after his remarks the country had a “massive riot, and death, and problems.” In fact, two days after the rally, a riot broke out in an immigrant neighborhood but no one died and the biggest surprise for many Swedes was that a police officer found it necessary to fire his gun. The Swedish leader was asked Tuesday if he stood by that critique after The New York Times reported that gang-related assaults and shootings were on the rise in Sweden and that crime and immigration were expected to be key issues in the country’s upcoming general election. Löfven did not directly address his comments about Trump. He said he’d inherited legislation that was “not sustainable” when it came to refugees and that he’d worked to reduce the number allowed into his country. He also said his government had dedicated more resources to police and cracking down on organized crime and terrorism. And Trump said he was not worried that Moscow will meddle in the upcoming midterm elections because the U.S. will take steps to prevent it. “Whatever they do, we’ll counteract it very strongly,” the president said.